Sometimes photographers are our favorite people ever, and this is one of those times. Thanks to a few photographers, we saw Charlie Hunnam and David Beckham’s bromance on the red carpet, and we want more…much more. 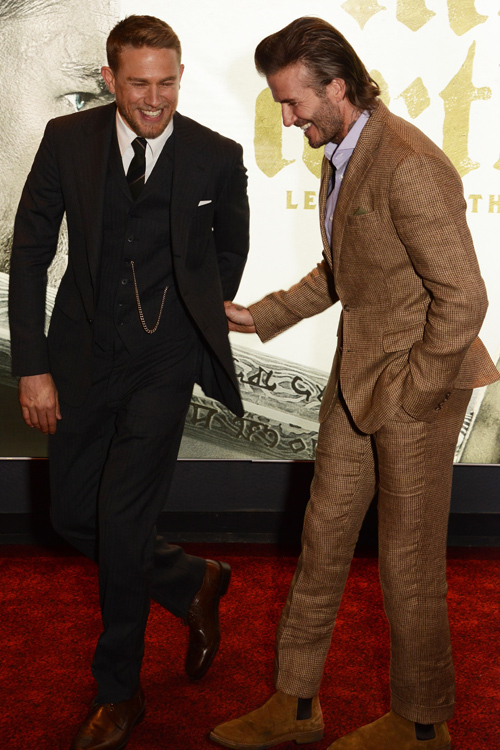 On Wednesday, the two actors — yes, Beckham is now an actor — flaunted their bromance down the red carpet. 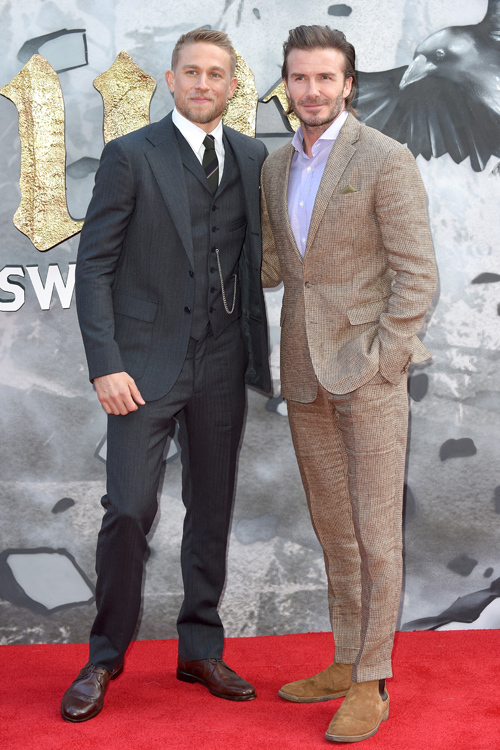 They both looked dapper as they posed for pictures at the premiere of King Arthur: Legend of the Sword in London. While we knew that Beckham had a small role in the medieval film, we didn’t know he was so buddy-buddy with the film’s star. Now we know, and we will never forget it! 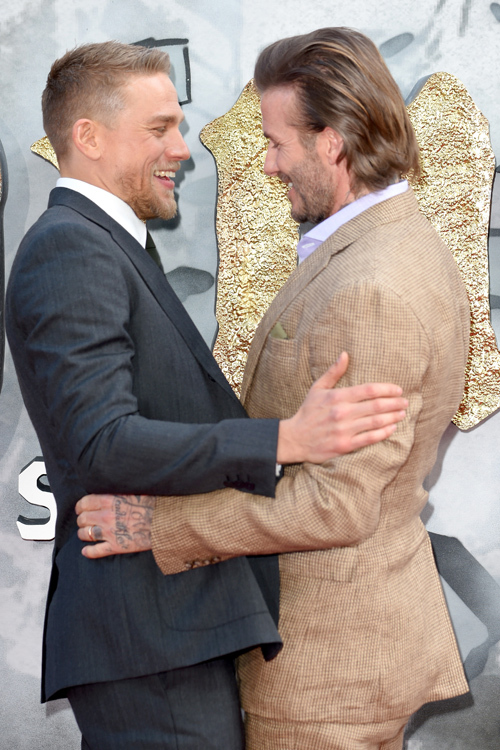 As Hunnam and Beckham made their way down the carpet, photographers captured every moment of their bromance. Yes, we are little obsessed, but if you see the pictures you’ll understand. "He’s super cool and really inspiring," Hunnam told People at the premiere about his co-star. "He worked really, really hard and it became very clear immediately why he’s enjoyed the success he’s had. He just has a ferocious work ethic." Okay enough talking, let’s get to the bro-love! When the two stars first saw one another they went in for a handshake (see above), but then it was hug time. Then the gorgeous Brits starred at one another and couldn’t help but smile. Ah, swoon. When they started walking the carpet, they got a bit tangled and had a good laugh about it. PS: How handsome do these men look in their spiffy suits? Seriously, they couldn’t stop laughing, and we’re so okay with it. Hunnam and Beckham are pretty much exactly what we think about when someone says an English hunk, and we’re booking our flights to London ASAP. In April, the former Sons of Anarchy star gushed about the soccer phenom noting that he really worked hard on this film. "I'm not a football man, so upfront, I didn’t really have a strong feeling one or way or another," Hunnam told Mr. Porter. "But by the time he left, I had a little bit of a crush on him. He was pretty f**king cool." We’re pretty big fans of both of these guys. We can’t wait to see them on the big screen together — and hopefully more bro-mantic photos soon. Check out Hunnam and Beckham in King Arthur: Legend of the Sword beginning May 12, 2017.